Sweaters! Jackets! Boots! Winter is the season of Instagram-worthy outfits. But none of it matters if it’s hidden under piles of down. The key to looking more like a street-style star and less like the Pillsbury Doughboy? These five layering tricks. If you don’t play your cards right, that amazing faux-fur coat you scored is going to add tons of extra bulk. Keep everything streamlined by working from the lightest fabric to the heaviest. For example: Start with a paper-thin long sleeve, followed by a lighter jacket, then top it off with your heavy-duty coat. Finish with a beanie as the warm cherry on top. When you want to put the rest of your outfit front and center, opt for a turtleneck instead of an overwhelming scarf, which can be distracting. It adds barely any bulk, but still keeps your neck nice and toasty. 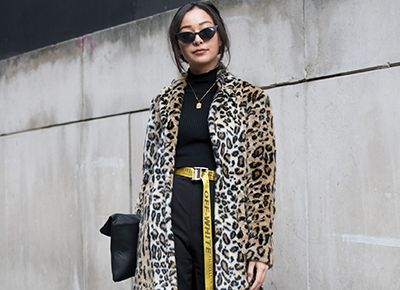 Fun fact: Belts can go outside your coat, too, lending much-needed shape to a bulky winter coat. If your coat doesn’t come with a belt, experiment with any other style for a unique look. Don’t be afraid to rock an oversize coat—it is cozy season after all! Just keep proportions in check while you’re bundling up. Go for slim fit-pants and a top in the same color to balance it out.